Whip the first three ingredients and place in refrigerator to chill. Sift together the flour, baking powder, 1/4 C. sugar, and salt onto a piece of waxed paper. Beat the egg yolks lightly and add the milk, vanilla and melted butter. Drop in the dry ingredients and stir just enough to combine. 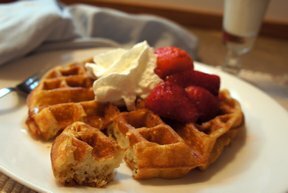 In a separate, clean bowl, beat the egg whites until they are stiff but not dry and fold them into the batter gently. 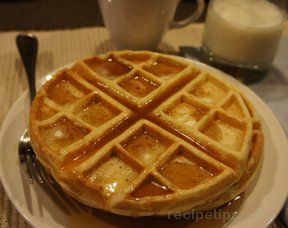 Bake in a seasoned waffle iron at medium heat until the steam stops escaping. 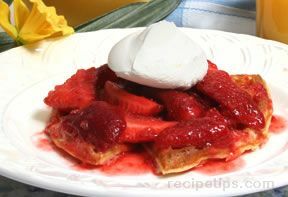 Dust the baked waffles with confectioner's sugar and top with whipped cream. Sliced strawberries or peaches may be served on top.